The sign at Lyme Academy College of Fine Arts prior to its take-over by the University of New Haven. A meeting is being held this afternoon at Lyme Academy at 4:30 p.m. to which all “alumni and friends of the college” are invited to discuss the future of the college. The meeting is hosted by University of New Haven President Steven Kaplan and Lyme Academy Dean Todd Jokl. Q: Can students who are enrolled as freshmen or transfer students starting this month receive a full refund? A: Of course. Questions may be directed to the Lyme Transition Team at 860.598.5067 or lymetransition@newhaven.edu or on the website:newhaven.edu/Lyme. Q: What is the plan for the Southwick Commons? 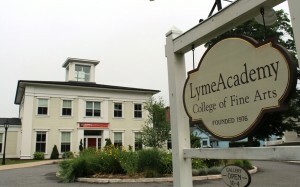 A: Lyme Academy College of Fine Arts is in a multi-year contract with the developer, and as of now, there is no change. Q: Can you comment on the timing of this announcement in light of Lyme holding a major fundraiser yesterday (Sunday)? A: We felt that it was in the best interest of new and returning students and their families to give them this news as soon as we could. This event had been scheduled for some time, and any money raised will be used to support our students this academic year. Q: Similarly, can you comment on the timing of this announcement in light of Lyme not holding its traditional major fundraiser, the ArtsBall, in June? A:There is no connection between these two events. More to follow on this story.